Culminating our April events at Boulder Fracking Summit, Boulder Bookstore, Highland City Club, Conference on World Affairs and Fiske’s Astronomy Day, we have arrived at CU’s Fiske Planetarium Love in the Anthropocene! 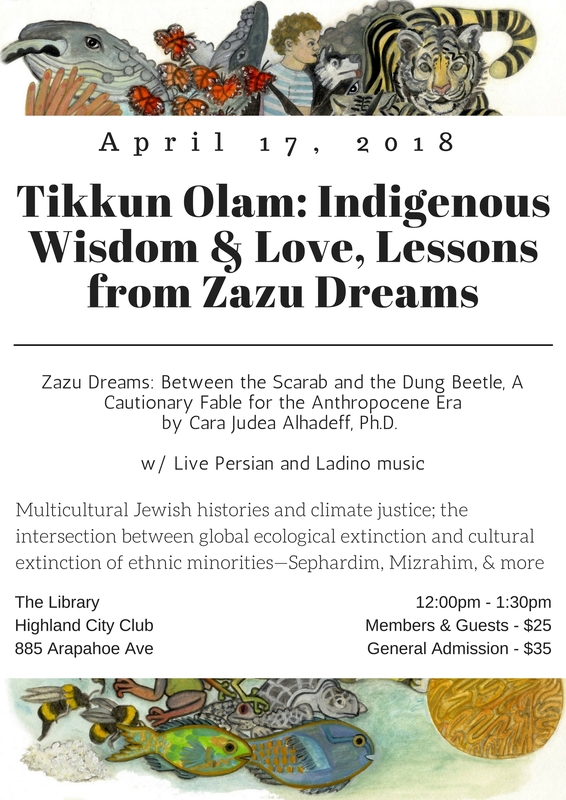 “Zazu Dreams: A Declaration of Interdependence, A Love Story” is based on the critically acclaimed 2017 book, Zazu Dreams: Between the Scarab and the Dung Beetle, A Cautionary Fable for the Anthropocene Era (www.zazudreams.com). 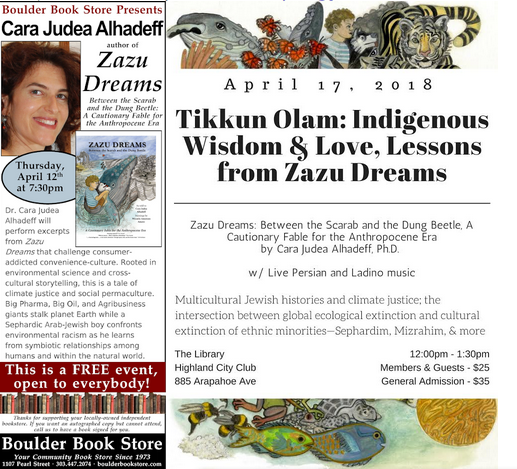 Author, Dr. Cara Judea Alhadeff (www.carajudea.com), and biodiversity advocate and educator, Rob Mies, will perform excerpts from Zazu Dreams that challenge consumer-addicted convenience-culture. Rooted in environmental science and cross-cultural storytelling, this is a tale of climate justice and social permaculture. Big Pharma, Big Oil, and Agribusiness giants stalk planet Earth while a Sephardic Arab-Jewish boy confronts environmental racism as he learns from symbiotic relationships among humans and within the natural world. This creative non-fiction performance will include lush visuals by Professor Emerita at Penn State University, Micaela Amato Amateau (www.micaelaamato.com), live Persian and Ladino (Judeo-Arabic/Spanish) music by Catrene Malshey, Pete Jacobs, Gabrielle Shapiro, Dhanwant Garcia, and the Persian Cultural Circle, and calls-to-action from local environmental and cultural organizations including the Endangered Species Coalition and WildEarth Guardians. *The pre-performance Persian dinner at 5pm prepared by Hadi Montazeri and Mahsa Savadkouhi will take place at C4C next door to Fiske Planetarium. Choreographers/dancers Maren Waldman (www.marenwaldman.com) and Megan Yalkut (www.hamsadesign.com) will lead diners from C4C to planetarium 6:15-6:30pm. Meet mystical figures along the way!